With some 66 hits under his belt, Tomislav Bokšić, or Toxic, has a flawless record as hitman for the Croatian mafia in New York. That is, until he kills the wrong guy and is forced to flee the States, leaving behind the life he knows and loves. Suddenly, he finds himself on a plane hurtling toward Reykjavík, Iceland, disguised as an American televangelist named Father Friendly. With no means of escape from this island devoid of gun shops, this island with absolutely no tradition for contract killing, he is forced to come to terms with his bloody past and reevaluate his future, to tragicomic effect. 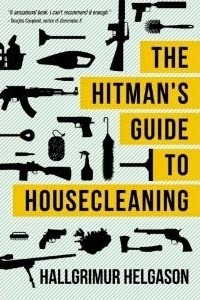 The Hitman's Guide to Housecleaning is a story of mistaken identity, human destiny, and the forces of good and evil present within us all. I thought this sounded like an interesting read ... but I was wrong. It was fairly tedious, really. I don't really know what the point of the story was. And I know not all stories need a point. But this one really did not grab me whatsoever. It was all so very blah. Time I'll never get back.